This year, the church was able to help 7 families in the area have a brighter Christmas. 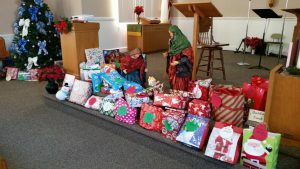 The stage was full of presents for the families. December 18th, we also went caroling and brightened the day for the residents of several long term care facilities, leaving each one with a “goodie bag” of Christmas treats. Come join us on Christmas Day at 10:30 am for a “Happy Birthday to Jesus” worship service. Sunday, August 21st- Thursday, August 25th, 2016 for Submerged! VBS. Deep within the mysterious sea, kids submerge themselves in God’s Word, and discover that Jesus didn’t just see what’s on the outside of people. He looked deep down on the inside. So grab your goggles, step into your flippers, and dive in to find truth below the surface! Kids ages 4-6th grade are invited to attend at no cost. Have questions? Please call us at: 517-490-7222.